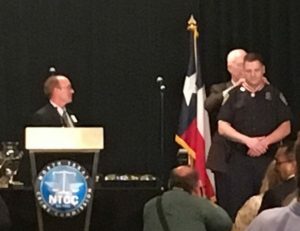 Dallas (WBAP/KLIF News) – Senator John Cornyn has awarded Dallas VA Officer Brandon Holloway the Congressional Badge of Bravery for his actions at a clinic near the Dallas VA last year. On October 28, police say a patient at a clinic near the hospital got upset about his medication and tried to hit a clerk. They say the patient went to his car and pulled out a gun. Holloway shot the patient in the hand, forcing him to drop the gun. Holloway then provided first aid until paramedics arrived. “You’re a heck of a shot,” Cornyn said as he placed the award around Holloway’s neck Wednesday. Jeff Milligan is the director of the VA Health System of North Texas. When Holloway saw the gun, Milligan says Holloway positioned himself between the shooter and the entrance to the clinic. “Officer Holloway not only put his life on the line for the medical clinic occupants, he also did everything in his power to offer assistance to the patient and showed great restraint until he felt the threat was so imminent that he had to act,” Milligan says. The patient recovered and was charged with aggravated assault on a public servant. Cornyn says the case showed the added responsibility police officers now accept.